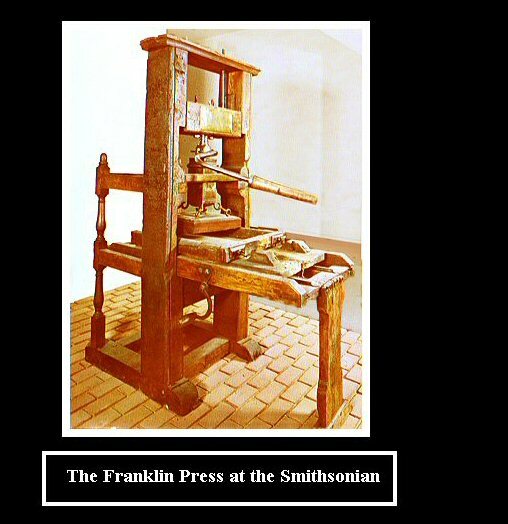 Top: The Most Famous Press in America: The Franklin Press from England. Today it is in the Smithsonian Institution in Washington D.C.
Bottom: The Oldest Press Made in America: The Bauman Press, from Ephrata. Today it is in Carlisle's Cumberland County Historical Society. In 1972, printing historian Stephen O. Saxe published an article titled "The Goodman Common Press, The Oldest American-Made Press," in "Printing History," the journal of the American Printing History Association. He is referring to this Bauman press from Ephrata. The press was built in Philadelphia, circa 1787, by John Goodman. 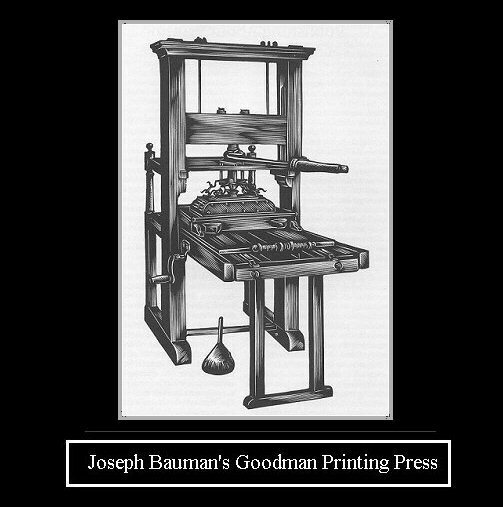 The press was owned by printer Joseph Bauman, in Ephrata, Lancaster County, in the early 1800s. This wood engraving of the Goodman press is by John DePol, one of the premier American wood engravers of the 20th century.